Photography: a visual remembrance of a beautiful moment. 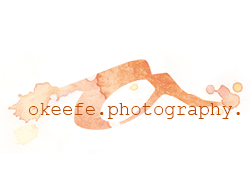 Here at Okeefe Photography, we love what we do. We love laughing with couples, snapping sweet moments, and creating a piece of art for our clients. Whether it's a wedding, a proposal, or a family reunion, we know each moment is special. Each smile, each embrace is a beloved snapshot in time. It should be cherished and relived with every glance at the picture. With an eye for the right moment and a dash of fun, we capture your special moments. Photography is such a special way of documenting life. Weddings, family reunions, anniversaries, Christmas portraits, maternity sessions, engagement sessions, proposals...they all make us smile. Each moment holds significance and we are truly honored to capture those memories for you. Over the years, we've worked hard to refine our craft, specializing in modern-romantic photography set in our gorgeous mountains. We scout new locations, watch for the right light, and help guide you to get the best possible moments. Our 14+ years of experience have taught us how to get kiddos to giggle (the absolute BEST photos! ), how to ease the jitters of a nervous bride, and how to facilitate an unforgettable experience. We feel incredibly lucky to live and work in Big Bear and we can't WAIT to work with you! I don't even know where to start with you. Truly, I felt like I had a Big Bear friend by my side throughout my entire wedding and I can't thank you enough for your support, encouragement, professionalism, outstanding work and overall wonderfulness. Of all the vendors we had in Big Bear, you were our favorite on a whole different level. You are not only insanely talented at what you do, but you are a tremendous human being. I feel so lucky and honored to have had you by my side to keep me calm, and centered and present. Sincerely, Jenna, it wouldn't have been the same without you and we feel incredibly #blessed to have found you. Best. Weekend. Of. Our. Lives." Sign up to receive special offers, hear about our upcoming events, and learn some useful photography tips.